What’s the matter with the AfD? What about the Saarland election? In the election for the Saarland state parliament, the AfD won six per cent of the vote, which is a bit of a comedown after the party’s performances in the last round of state elections in 2016. The media read this as an omen for the Bundestagswahl in September, which is nonsense for a number of reasons: First, the AfD tends to do better in the eastern states. Second, and more importantly, state elections tend to be affected by federal politics, but only up to a point: first and foremost, they are regional affairs. In the case of the Saarland, this means (amongst many other things) that the regional chapter of the AfD is so closely enmeshed with right-wing extremists that the national leadership tried to disband the chapter only last year. Yes, you read that right. The move was blocked by the AfD’s highest internal court, which ruled that the evidence against the chapter was insufficient. The national leadership then asked the state party to clean up their act and not to take part in the election. The state party declined that request. Their frontrunner candidate was caught on camera selling Nazi devotionalia in his shop only weeks before the election. And they still got six per cent of the vote in a high turnout election. Not too shabby, I would think. For all purposes and intents, the Left and the AfD are currently indistinguishable. But the same can not be said for the FDP. 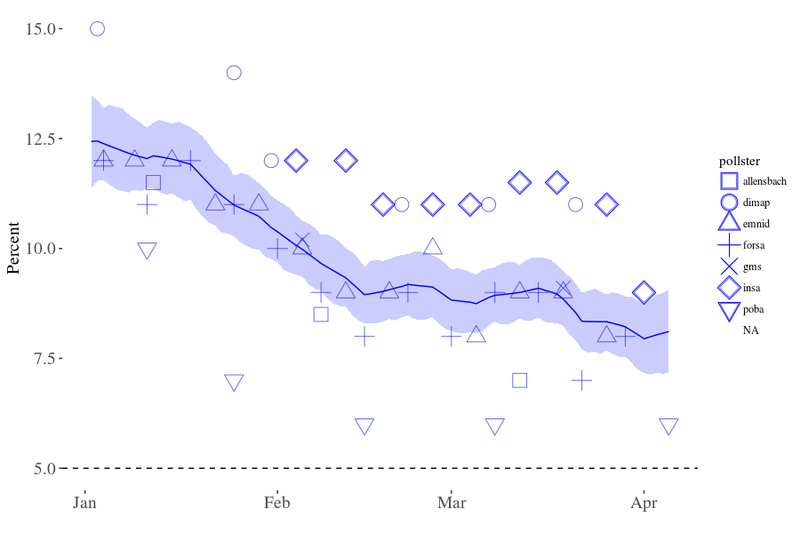 For the first time since I began pooling the polls in January and less than six months before the election, support for the FDP may have fallen below the electoral threshold. 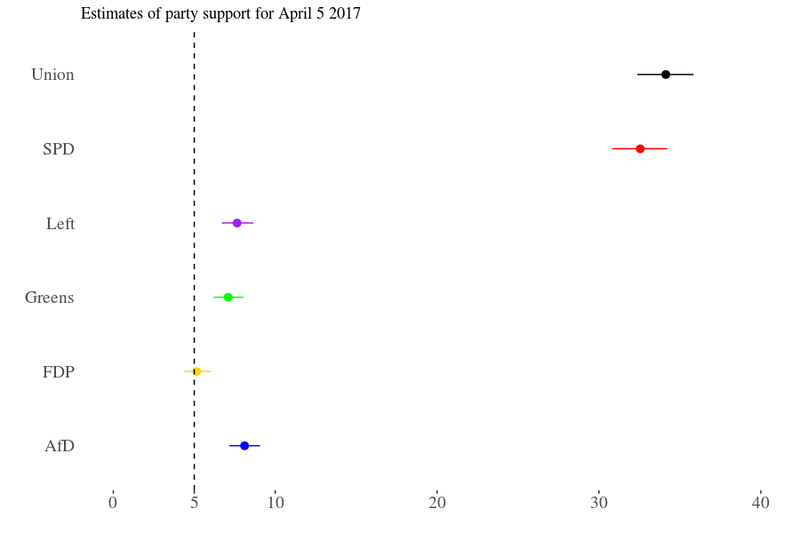 As of Wednesday (the mathematical midpoint of the FGW poll), the estimated probability of the FDP having exactly five per cent support or more was 64 per cent. As one of the great political philosophers of our time is apt to say: SAD. Losers? 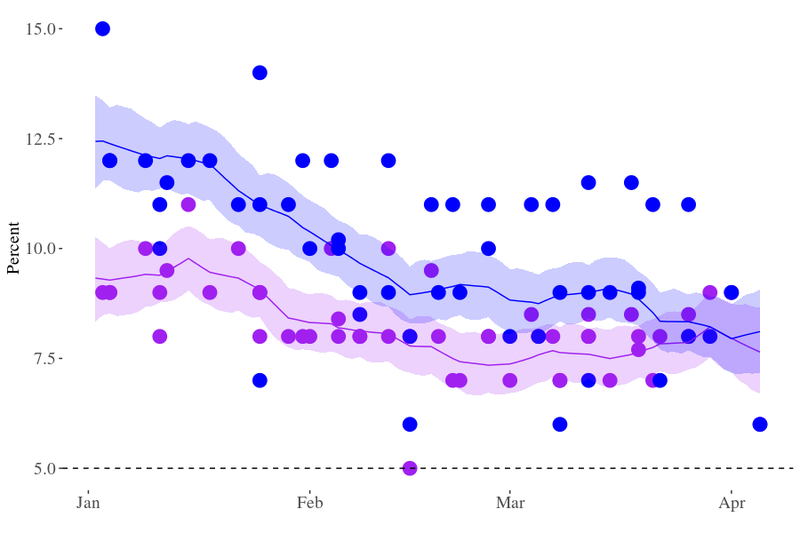 Support for the Greens, on the other hand, is lower than it was in January but has been stable at this level for the last two months. And finally, the major parties. 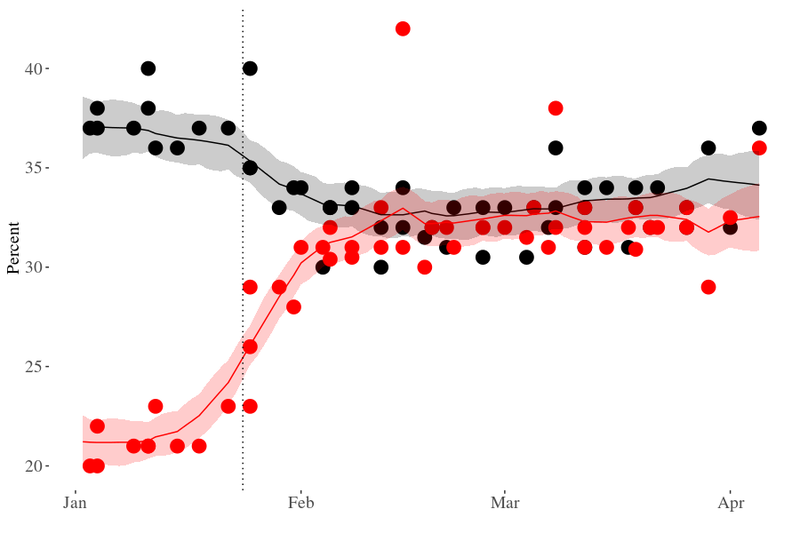 According to their political preferences, the media have variously reported an ongoing Schulz effect, the Christian democrats catching up with the SPD, or Merkel pulling far ahead. The latest polls seem to support any of these views. They look rather noisy, and estimated levels of support are still overlapping: the Christian democrats could be anywhere between one point behind or five points ahead of the SPD. In sum, the overall estimates have not changed much over the last two weeks. The two major parties are more or less neck-on-neck, with the CDU/CSU still struggling to re-establish a clear lead. 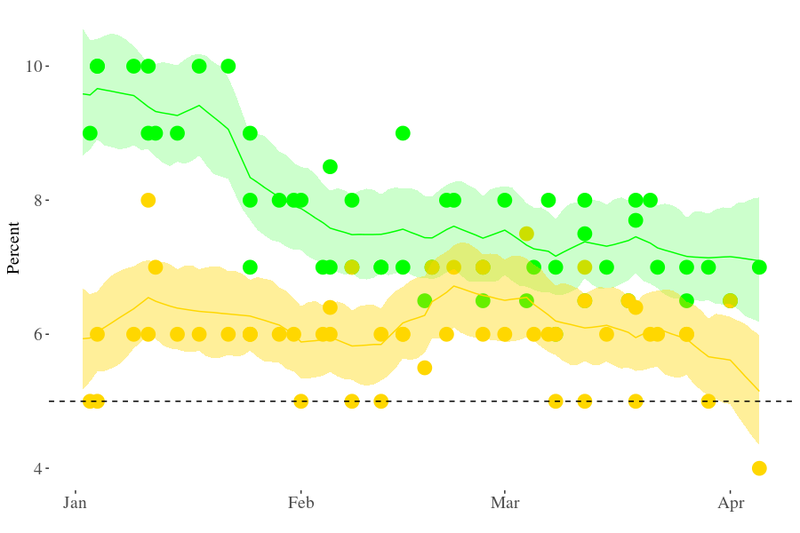 The AfD, Left, and Greens are all well below ten and well above five per cent. The only relevant change is that the FDP has slipped back a bit, which brings them perilously close to the electoral threshold.